We all know how much I love the jewelry company, Brooklyn Thread. Owner, Joanna Torres, was kind enough to send me one of her newest additions, the Raw Pyrite Stone Ring. It sparkles and draws attention like no other. I have never seen rings like these before and I had to get my hands on one. Joanna is so unique in her raw, edgy designs and even the packaging is spectacular! Brooklyn Thread has become my go to for gems! Check them out today and get on the fashion train with her beautiful jewels. Of course, while looking at the site I had to have this adorable LOVE Necklace. It reminds me to treasure all the wonderful people in my life and it is totally cute. A staple to my wardrobe are bracelets. 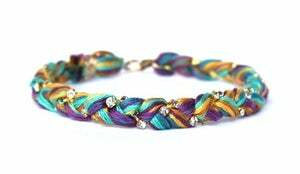 They can be beaded, gold, silver, and hopefully from Brooklyn Thread. I have a bunch of their bracelets and am always asked where they are from. Most of them have a special meaning and are good luck! Bonus, I think so!